Roof ventilation is critical to any roofing system. It affects the longevity of your roof, as well as the cost of energy spent trying to cool your home in these hot summer months. Good roofing ventilation gives great benefits. It……….. This happens because the heat and moisture build-up in your attic is reduced. If not, damage to your shingles, wood framing, ceiling, siding, paint and/or wallpaper can occur. Also, when moisture builds up, this can be a major attraction to wood-eating insects such as termites. Reduces your energy costs by reducing the work load on your air conditioner and furnace. Again, reducing the heat and moisture build-up in the attic makes the positive effect! Reduces your indoor temperature extremes. The key result is that your upper level temperatures won’t be 10 degrees higher than your lower level temperatures. Roof ventilation is all about providing the openings for cooler air to enter in and the vehicles through which hot air and moisture can rise and escape. The intake of this cooler air occurs through the EAVES, SOFFITS AND FASCIAS of your roofing system. The exhaust part of your roofing ventilation system occurs at or near your roof ridge, allowing moisture and heat to escape. Your roofing professional does a lot more than just nail shingles on your roof or apply flat roof sheeting. The roofing professional is going to be sure that all the parts of your ventilation system are in place to save you energy costs and provide a long-lasting roof. Since your commercial roof is a great investment, the goal is to preserve and keep this investment in the best shape possible for as long as possible. Following these two major recommendations will do just that. Keep a Roofing Log: If you have not started this practice, now is the time. This log will keep track of ALL maintenance people, companies, etc. who go on your roof for whatever reason. This way, if sudden damage or leakage is observed, knowing who was on your roof last might give a clue as to the cause. Spring into a more thorough habit of roof maintenance now, and you will suffer NO regrets in the future. Spring time is one of the best times to have your asphalt sloped roof inspected. Problems caught early and repaired will save your structure from further damage inside and out. The asphalt sloped roof requires an exterior and interior inspection. As the homeowner, you want a regular roof maintenance program to prevent unnecessary expense down the road. Below is a check list of what your roofing professional should be looking at when they come to inspect YOUR roof. Arranging for your roof inspection now will save you much time, trouble and money in the future. Happy Spring!! 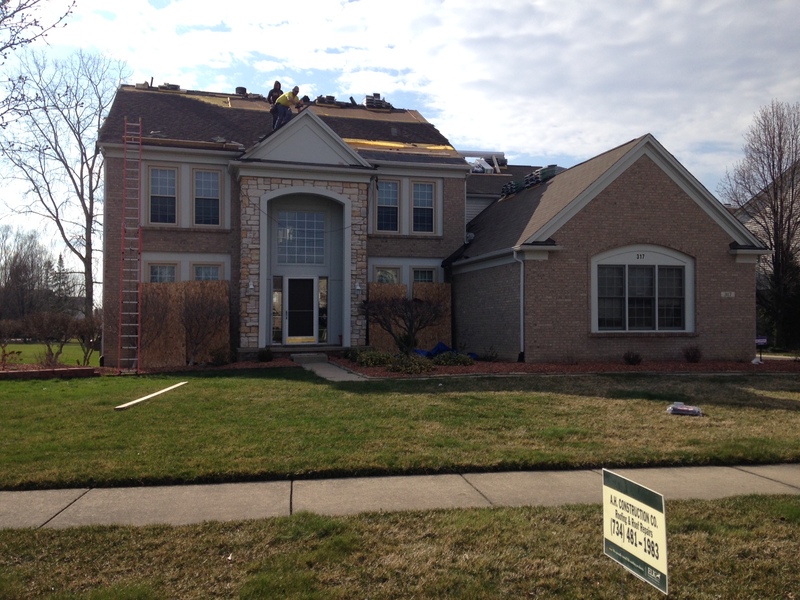 Roofers do work all year long. As a matter of fact, some prefer the colder weather because of the extreme heat during the summer. Yes, the winter or cold weather should never stop home or business owners from getting the repairs needed on their roof. Leaks and external damage left unattended can cause severe structural damage, spelling out greater expense.There are some limitations, cautions, and extra steps to consider with winter roofing. Nevertheless, work can get done when needed. 1. If you have snow fall on your roof, it usually takes the professional 30 -60 minutes to shovel off so that the work area is cleared. 2. Some roofing materials behave differently below 40 degrees Fahrenheit. 3. Some roofing materials should not be installed at all below 40 degrees and some can be applied any time of the year, no matter the weather. Flat roof materials whose seams are hot air welded do fine when installed in the winter. These include PVC (Polyvinyl Chloride) or TPO (Thermoplastic Olefin). Duro-Last flat roofing material is an excellent example. The problem for flat roofs is when alternative rubber roofs are installed in weather below 40 degrees. The manufacturers of these roofing materials advise AGAINST installing their materials in such temperatures because of the adhesive. Rubber roofs require an ADHESIVE to be used for securing the seams, and below 40 degrees Fahrenheit these adhesives freeze, which means that they do NOT bond. If no bond, then leaks will occur, and your manufacturer warranty will be VOID. The sloped asphalt roofing of most homes can be installed in the cold winter, but some precautions must be taken, as well. 1. Be sure not to bend or crack the shingles. 2. Because the seal between the overlapping asphalt shingles is dependent on the HEAT from the WARM sun shining on it, this won’t happen until the warm weather arrives. So, unless, the shingle is nailed down properly, material could blow off and cause a leak. Roofing season is all year long, but this is especially true when there are real problems, causing not only leaks but structural damage to your home or business. Keep an eye out, look for issues and, when observed, be sure to call your roofing professional. Flat Roofs: Gutter and Drains Matter! Leaks on valuable merchandise or equipment, structure rot, and roof rot are all situations commercial building owners and managers want to avoid. First line of defense is a high-quality, maintained roof drainage system. If this is in order, you are all set up to prevent expensive damage from rain, snow, wind, and wildfire. High-quality flat roof drainage systems allow for proper water flow. This flow reduces the risk for interior water damage t o the building which is frequently caused by water backing up onto the flat roof. Flat roof drainage systems also serve as excellent conduits for melting snow which decreases the weight load bearing down on the commercial roof. Ice dams that can trap the snow and ice on a flat roof. This increases the roof load. The accumulation of natural debris (leaves, branches, bird nests, etc.) 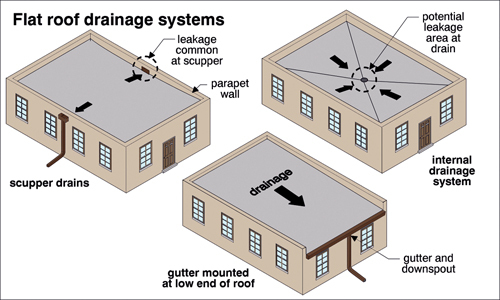 which serves to back up water flow onto your flat roof and the building structure. Improperly sloped gutters or misaligned drain spouts cause water build-up which lead to gutter, roof and structural damage. Also, be alert that water can accumulate too close against your building leading to further damage. Gutter and Roof Drains are a BIG DEAL…………for any structure. As managers of commercial buildings, be sure to take the time, NOW, to inspect your flat roof gutter and drainage systems frequently. The trouble you take today will save you a TON of trouble (time and money) in the future.